Smithworks Vodka burst on the scene in 2016 and has quickly made a splash in the spirits market. For those of you uninitiated with this fairly new vodka, Smithworks came to life as an unlikely partnership between Pernod Ricard (the world famous spirits brand) and The Voice’s own Blake Shelton. This partnerships is somewhat similar to the celebrity endorsement of Ciroc in the early 2000’s and P. Diddy, but with a redneck, deer hunting country singer instead of a swagged out rapper, which seems to suit the Smithworks brand quite well. You probably know Pernod Richard for some of their more well known brands like Absolut, Jameson, and Seagrams to name a few. You probably know Blake Shelton for his TMZ worthy relationship long time girlfriend Gwen Stefani. Together, Smithworks and Shelton have devised a vodka any patriotic, bald eagle loving, warm blooded American would want to try. I mean just look at that label… “Made in America.” A tractor like your granddad used to drive. And do you really think the red, white and blue color scheme is a coincidence? Kudos to the marketing gurus who designed this label. A+ work right there! Beyond the celebrity endorsement and patriotic marketing, what is this vodka all about? After talking with the brand and researching online we found out that Smithworks Vodka is produced with corn from Kansas, Missouri and Oklahoma and sources the water from Lake Fort Smith in Arkansas. 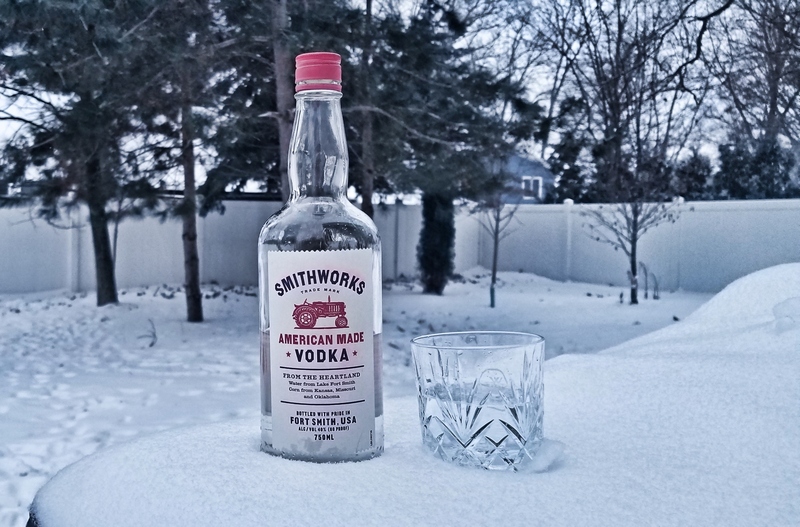 Before the vodka reaches the bottle, Smithworks is distilled three times and charcoal filtered in an attempt to create a clean taste and smooth finish. The vodka is then finished and bottled in Fort Smith, Arkansas. Alright, we know why you’re here… you want to know how it tastes and if you should buy it. Well, let’s get down to business. After sipping neat, on the rocks and mixing up several tasty cocktails here’s what we think about Smithworks Vodka. Overall: Our tasting panel really enjoyed Smithworks Vodka. This is a very neutral vodka that is surprisingly easy to drink. A good test for any vodka is to see if you can sip it neat or with an ice cube. If you can, you have a smooth, easy to drink that vodka. Our tasting panel proved that you can easily sip on the Smithworks if you were inclined, but man it really shines as a base for craft cocktails. If you do drink it straight, you will get just a hint of a peppery finish which is kind of nice and could make for excellent addition to your next bloody mary. Overall, we are impressed with how well the Smithworks Vodka is crafted. Rarely due you see a vodka come this strong out of gate and win awards with a price point below $20.00. This just shows the commitment that the brand and distillers have made to producing a quality, American Made spirit. Directions: Add the vodka and soda together in a glass of ice. Garnish with Lime. According to Blake, the perfect drink for the pre-show, post-show, or for relaxin on the porch! Definitely something I will try out!